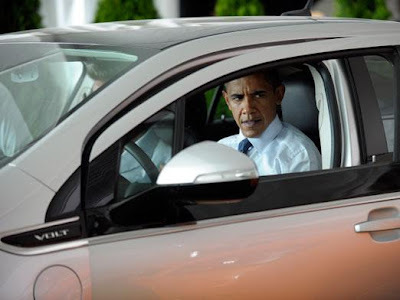 President Barack Obama announced today that the U.S. government will buy only advanced technology vehicles — such as hybrids and electric plug-ins — by 2015. The government already has doubled the number of hybrids in the 600,000-vehicle federal fleet. "Here's the bottom line — there are no quick fixes. And we will keep on being a victim to shifts in the oil market until we get serious about a long-term policy for secure, affordable energy," Obama told a crowd of several hundred at McDonough Arena. "We cannot keep going from shock to trance on the issue of energy security, rushing to propose action when gas prices rise, then hitting the snooze button when they fall again." The reduction would be more than the 11 million barrels of oil a day the United States imported in 2008, the White House said today. Obama noted that the U.S. has just 2 percent of the world's proven oil reserves. The U.S. consumes about a quarter of the oil. In 2010, the government purchased 23,000 more fuel-efficient vehicles for the federal fleet, including almost 9,000 hybrid-electric cars. This year, the government will buy more fuel-efficient vehicles, including its first 100 plug-in electrics. White House aides said the president's plan to reduce imported oil relies on improving efficiency for half of the anticipated reduction, but they said the government hasn't settled on a proposed increase for the 2017-2025 timeframe.